Sichuan Province, Shu for short, is located in the upper reaches of the Yangtze River in southwestern China. Sichuan, known as the land of abundance and home of the giant panda, covers a vast area of 485,000 square kilometers, making it the country's fifth largest province. Sichuan, which has a total of 1,419 rivers, is also dubbed "the province of one thousand rivers." Sichuan is made up of two geographically distinct parts. Its eastern part lies mostly within the fertile Sichuan Basin, while its western part consists of the numerous mountain ranges which form the easternmost part of the Qinghai-Tibet Plateau. Sichuan is high in the west and low in the east in terms of topography. Generally speaking, the western part is plateaus and mountainous regions some 4,000 meters above sea level while the east features the basin and hilly land with an elevation between 1,000 and 3,000 meters. 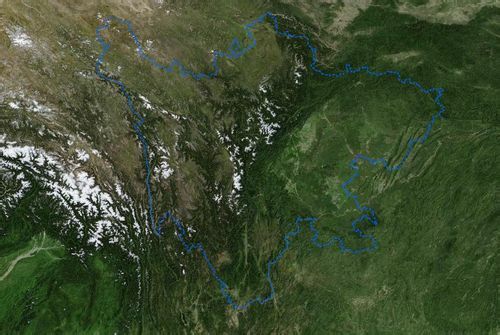 The Sichuan Basin, covering an area of 165,000 square kilometers, is one of the four largest in the country. The elevation within the basin ranges from 200 to 750 meters, sloping down from north to south. Sichuan borders Qinghai in the northwest, Gansu in the north, Sha'anxi in the northeast, Chongqing in the east, Guizhou in the southeast, Yunnan in the south, and Tibet Autonomous Region in the west. Chengdu, the capital city of Sichuan, is the hub for business and trade in western China.